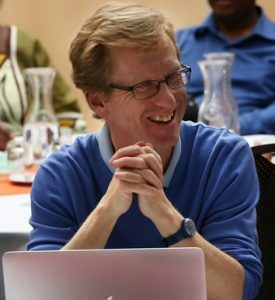 Professor Anthony Bebbington leads the ESID research programme on the politics of natural resources and inclusive development. He tells us here about his life and work, and why he challenges the notion of ‘development’. The fact that I couldn’t work in ‘development’ practice. High school geography introduced me to poverty, famines and the Green Revolution (thank you Messrs James, Jones and Hadfield), and then university forced me to think theoretically about regional inequality, the historical dynamics of capitalist development (thank you Derek Gregory) and the detailed politics of the policy process (thank you Land Economy). Much else happened at university too and by the end I had decided I wanted to work in ‘development’ and social change. Every organisation I wrote to, however, told me (quite rightly) that I had neither experience nor skills. So, I did a PhD in order to get extended ‘field’ experience and knowledge of development organisations, so that I could be better placed to work in development. The PhD opened up all sorts of opportunities, but in retrospect it was also a bit of a trap. I have tried a few times to leave development research in order to be more directly involved in social change organisations – but one of the sticking points has consistently been the label of being ‘too academic’. As a result, I have always remained in the world of development research and teaching, even when I worked for a couple of years at the World Bank. I do believe, deeply, that research is central to social change. I also love working with committed students and then watching them build their lives and commitments post-university. So, I have more or less made my peace with the slot of ‘development researcher’. But it has taken three decades and, like all political settlements, it remains unstable. I have become fascinated by the ways in which extractive industries structure social and political life, and thus development possibilities. This is so at a sub-national scale, where resource extraction transforms rural landscapes and regional societies, at a national scale, where it shifts incentives and interests, and also at a global scale, where we see how control over the subsoil is central to climate change discussions and warfare, whether interstate or insurrectionary. So, our research explores different dimensions of these relationships. For ESID we have been asking how subsoil resources (minerals, oil, gas) have interacted with political settlements over the longue durée, each shaping the other in ways that have steered patterns of national social and economic change. In other work, we are collaborating with the Climate and Land Use Alliance to explore the interactions between extractive industries, infrastructure and forest governance, where the question is: ‘how does resource extraction compare with other drivers of forest loss, violation of forest community rights, and greenhouse gas emissions?’ Finally, I am about to begin a programme that asks how the relationships between mining, water and notions of social justice are governed, and could be governed, under conditions of climate change. My work has pretty consistently been in Latin America, a region that is very important to us as a family, though the three projects I mention here each involve comparisons across regions and I have found that really exciting. What do you think are the most important findings from your work with ESID? I ascribe to the view that there is not much new under the sun, so the fact that something is a ‘finding’ for me does not mean that it is news to other people. For the same reason, I believe that social science and humanities research is much less about discovery than it is about reiteration, keeping the argument going and providing new lenses on those arguments. In that sense, research should be to political and policy discourse what food and clothing are to the human body. With those thoughts in mind, I prefer to focus on what important things does this research remind us of, and what are its possible contributions to political discourses on development. First is that natural resource extraction never has been, and never will be, a panacea for development. Alongside the important benefits that it can deliver, it has consistently produced some very significant and difficult-to-reverse costs; it has consistently produced interest groups that are not terribly developmental; and it has consistently been more effective at producing rents than generating capacities. The discovery of mineral and hydrocarbon deposits can set a trap, one that is easy to fall into. Second, subnational actors and elites are central to the story of national development. This is probably always the case, but it comes through strongly for the cases of extractive industries. Resource extraction produces and induces powerful sub-national actors, and their imprints on national settlements and national systems of resource governance are clear. So, for political settlements theory, but also political action, the implication is that the story should never be only national. What are the greatest challenges currently facing the development sector? The word ‘development’. I do not come from the post-development or anti-development school, but I do believe that development is absolutely the wrong word for the challenges at hand. We should call them what they are: they are challenges of inequality; of injustice; of the most brazen and mind-boggling asymmetries of power; of cruelty; of devaluation of life, both human and non-human. Most of the people I know in ‘development’ are motivated by these issues, not by some tepid notion of ‘development’ making things better. So, the development sector would, I think, gain if it were to stop talking about development. The challenges are far more serious and persistent, and they should be named for what they are. What is one change you most want to see happen in development? It is hard to answer this question without sounding preachy – which itself is one of the deepest problems of development, politics and academia. I think that perhaps we all need to be much more angry with the way things are. But this should be an anger with humility and without hypocrisy, an anger motivated by an ethic of care, rather than a predisposition to blame. Tell us a little about your life and how you spend your spare time? My life is my family and my work, and between the two there is not much spare time left – or perhaps I fail to create it. However, two things I do, and wish I did more of, are tend to the garden, and listen to music, mostly jazz, fusion and old rock (child of the 70s). After my family, and the beauty of the garden growing, I think the thing that makes me happiest is listening to Pat Metheny and Chick Corea. Oh, and on Saturdays I experience the slow suffering of monitoring the progress of Stoke City on BBC football’s live updates – a suffering not so dissimilar from Sam Hickey’s with West Brom, I suspect. Find out more about Anthony’s ESID research. Read his latest ESID working paper.